So, I'm thinking this blog needs a ghost writer. It's pretty sad to have post after post of just 'fess ups with nothing in between. It's starting to make me look like an airhead. This week has been ka-ray-zay, with housecleaning, and house showings, and Halloween, and field trips, and 8,000 timeouts for the two-year-old. Hence the no blogging. I was going to declare an official blog hiatus, but as soon as I do that I'm going to have the overwhelming urge to write dozens of posts. So, instead I'm just going to tease you with this underexposed photo of my bambinos on Halloween and say that it's possible I may write about it in the future. But please don't hold your breath. As a matter of fact, I think that's all I have to say for this 'Fess Up Friday. My confession is that contrary to popular belief, I don't have it all together and I'm trying to find balance. Heidi from Wonderwoman Wannabe wrote a fantastic series in October all about finding balance as a homemanager (click the button in my sidebar to read it). It was chock full of really great ideas, challenging reminders, and encouraging quotes. Part of what I came away with after reading her series was that it's okay to take a break and that blogging is only fun when I have the time to do it. So for the time being, I may not be posting every Friday, or even every week. 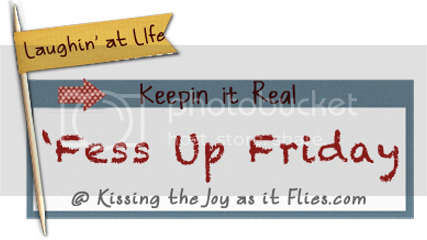 Just because I may not be 'fessing up doesn't mean you can't! I've decided to put the linky tool over in my sidebar, towards the top, so that all you funny girls with confessions to share can still link up and find eachother. If you haven't read through some of the posts that have been linked up, you're missing out. You girls crack me up every single week. Thanks for hanging in there with me and understanding if I'm a big old flake for a while. I'm about to embark on potty training and I'm going to need all hands on deck. Love you guys! I agree with Kar, but as I will admit in my Fess up, much to my surprise I did cry. There is something about your writing that nourishes me. I will miss your posts, but I get it. That is why I post so irregularly myself. Same priorities... sigh... God knows. :) Love you! Kira, you are so kind to mention my series. It was also and eye opening for me as well in the midst of it, to be sure. I fully and completely support you bloggy choices. I'm in the exact same position. Praying for wisdom, peace, and JOY in your days ahead. I look forward to hearing from you again when it is a blessing for YOU to do so. Life is full of seasons and I think we need to roll with them. Great picture of your Halloween kiddos! All the best for potty training! I checked out on blogging for the past 2 weeks, I kinda know what you mean! Little ones afoot keeping me busy. I read a post recently entitled "Blogging Less, Living More" - quite apt, huh? I love blogging breaks :) I like to sneak them in every now and then. It's quite liberating. Good luck! Keep us posted on the house! I'm just coming out of potty training with my 2 and a half year old and he's about got it. -- The running around naked or in cloth underwear seemed to help the most, even though it's a pain and messy for a while. I'll pray your little one gets it easily and I understand about the need for balance!